Courtesy of an Italian winery, a new outdoor fountain in Abruzzo now dispenses locally made red wine 24/7, for free, granting wishes of wine drinkers everywhere. The fountain opened on October 9th in the town of Caldari di Ortona in Abruzzo, and though the wine is always flowing and always free, those imbibing must bring their own containers! The fountain was placed along the Cammino di San Tommaso pilgrimage route, which stretches 196 miles from Rome eastward to Ortona on the Adriatic coast. Those who walk the route do so to reach the church that holds relics of Jesus’ doubtful apostle Thomas – and after walking nearly 200 miles, they are surely eager to receive free wine as a reward. 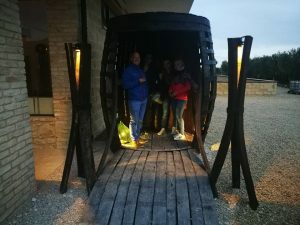 Thirsty travelers – and the rest of Ortona – owe thanks to the winery Dora Sarchese and the nonprofit group, Il Cammino di San Tommaso, that maintains the pilgrimage route. The nonprofit’s founders, Dina Cespa and Luigi Narcisi, modeled the Abruzzo fountain after a similar one on the Camino de Santiago pilgrimage route in Spain and collaborated with architect Rocco Antonini and Dora Sarchese owner Nicola D’Auria to make their dream of free wine a reality. “The wine fountain is a welcome, the wine fountain is poetry,” said Dora Sarchese, adding that the fountain is not a publicity stunt or a gathering place for drunkards. While fountains sometimes replace water with wine for special occasions such as festivals, this always-accessible fountain is the first of its kind in Italy. Just I want come and joined us!